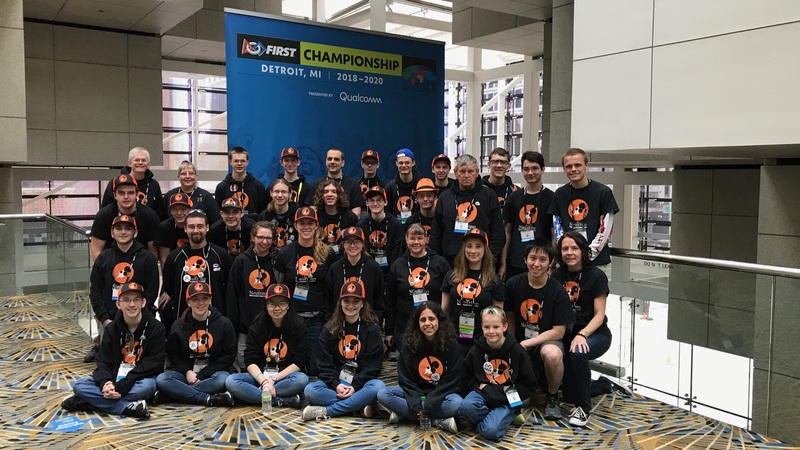 After months of hard work, dedication, and long nights, the team went to the world championships in Detroit with confidence knowing they’d perform well. After two days and ten matches of qualifying rounds, the team finished with a 9-1 win-loss record, seeding them 9th out of the 68 teams on their field. The team also met up with old partners 5914 Robotic Warriors and 525 Swartdogs from the Iowa regional, both performing well in their fields. After an extremely long Friday night (and Saturday morning) the team came up with their picklist and ended up as the 7th seed alliance captain, picking teams 2075, 4392, and 2202. After an intense quarterfinal matchup against the 2nd seed alliance of teams 1325, 694, 2016, and 870, our alliance lost the first two matches, finishing the teams official 2018 season. The team would like to thank its alliance members for their teamwork, and we hope to see them again in the future. We’d like to thank our mentors for this excellent and exciting season, and we’ll be very sad to see many of them go along with our senior class that has done so much to grow and help this team. We’d also like to thank our generous sponsors, making this trip, and this entire season possible. Special thanks to John Deere for dropping by our pit to learn more about FRC and our mission. Good job to all teams this season, and we can’t wait to see you for next year’s game, FIRST Destination: Deep Space. This was Team Neutrino’s first year visiting Wisconsin’s Seven Rivers Regional. The team made a couple changes to the robot for this competition, including an active intake, and refined other features of the robot. The team won 3 out of their 9 qualifying matches and was ranked 35th. The team was the first pick of the 5th seed alliance, which also included teams 2143 and 5148. The alliance lost in the quarterfinals, but it was great working with our alliance members! Although the team didn’t progress as far at this regional, we feel even more prepared for our next task: the Detroit World Championships! Starting this Wednesday (04/04/2018) Team Neutrino will be traveling to La Crosse, WI to compete in their second, and last, regional for the 2018 season. After improving their robot after the Iowa Regional, the team hopes to show off more of their hard work. The team will also be competing for Chairman’s against many other teams. You can watch the live stream here and the match schedule/results here! Team Neutrino is going to the Detroit Championships! After three days of scouting, repairing, driving, and hair pulling, Team Neutrino ended up 2nd seed, winning 8 out of 9 qualifying matches. As the 2nd seed alliance captain, Team Neutrino picked alliance members 525, Swartdogs, and 5914, Caledonia Robotic Warriors. After facing a hiccup in the semifinals, where Team Neutrino broke a chain and had to sit the first match out, the team won the Semifinals. In the finals, our alliance lost to the 4th seed alliance of 6424, 1156, and 6025. Team Neutrino had more success, though, by winning the Engineering Inspiration award, paying for their registration to the Detroit World Championships! 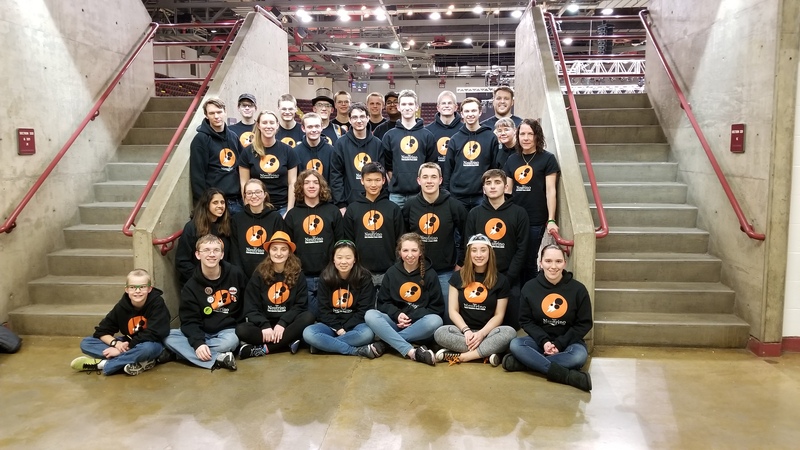 This was an amazing regional, and we can’t wait to see Caledonia Robotic Warriors again at 7 Rivers and both Swartdogs and Caledonia Robotic Warriors at the Detroit Champs! 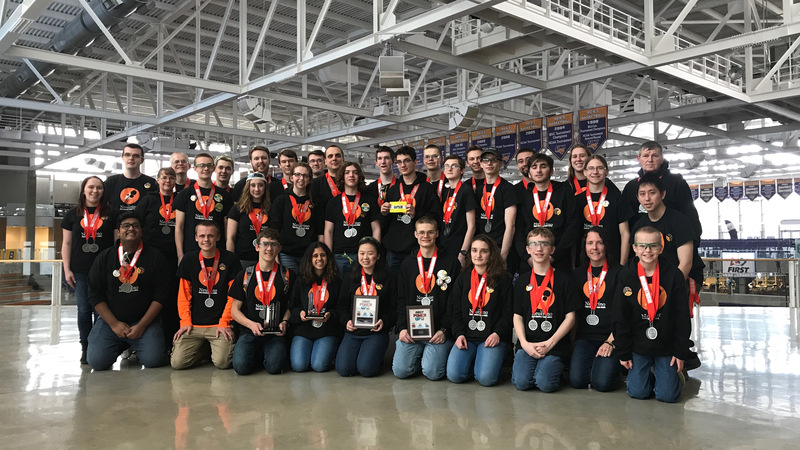 As Team Neutrino’s first official competition of the year, the Iowa Regional serves as the proving ground for the team’s hard work which began on Jan. 6 of this year. 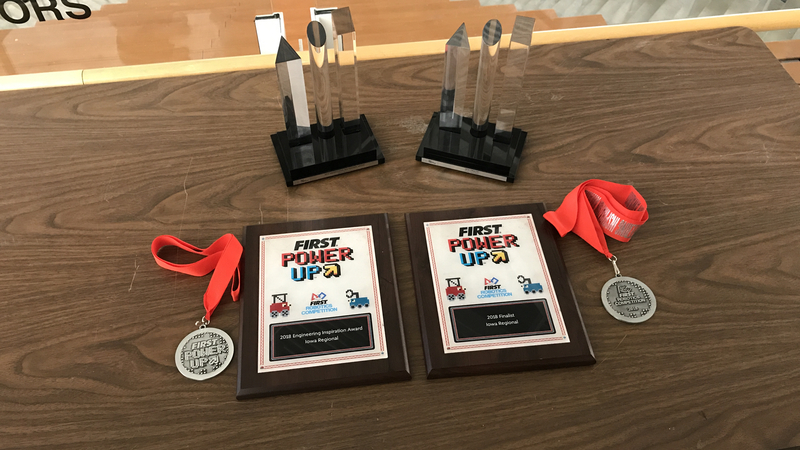 At the competition, the team will be both competing with their robot in this year’s event, FIRST PowerUp, and in the Chairman’s presentation. Make sure to wish the team good luck, and to watch the live stream here!